required the counter to be a high visibility kiosk, appropriate to its location on the concourse level at the World Trade Center. 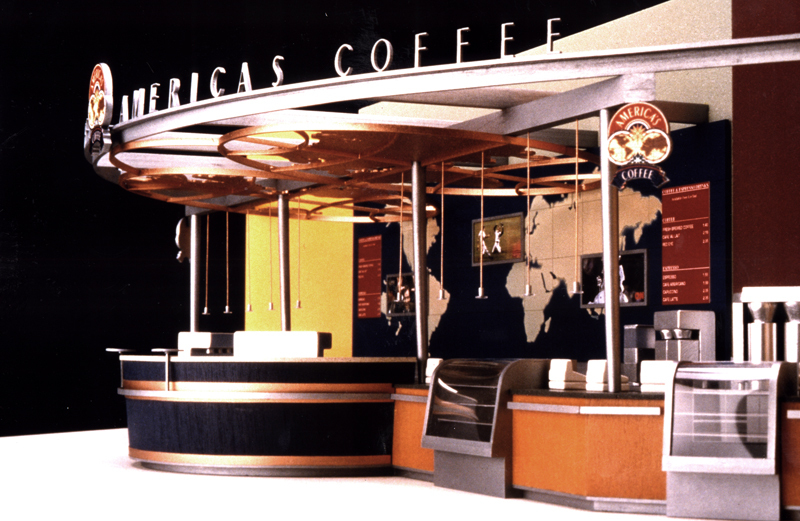 Special design considerations included an awkward existing corner site, asbestos problems, and the necessity of maintaining maximum visibility and efficient pedestrian queuing without interrupting the heavy flow of traffic in the busy public corridor.The architecture centers around the strong, pure geometry and tapered volume of the semi-circular ‘barista.’ The canopy structure, in shot-blasted copper and aluminum, is suspended above the counter and reinforces the strong shape of the kiosk while providing space for signage and lighting: two-foot high, stainless steel, pin-mounted letters spell out the name of the client. The canopy also conceals a track for a rolling security gate and the new walls provide pockets to store the retractable gate when the store is open.The materials were carefully selected to coincide with the overall dynamic of the space yet be functional and easily maintained. The front counter is a combination of marble and composite stone, while the back work counter is non-directional stainless steel. Blue aniline-dyed and light stained Ash create a differentiation between the central ‘barista’ and the serving counter. Serving trays at the specialty drink serving counter are laminated with heat-sensitive, liquid crystal sheets that react to the heat of the cups set on them, creating ephemeral designs on the counter. 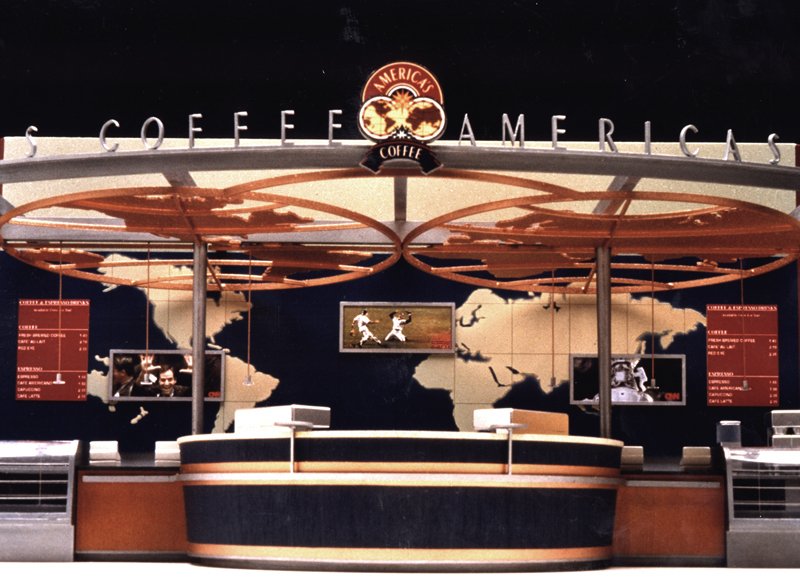 The rear wall is painted with a motif of the world map, pierced by three flat-screen, plasma televisions. The remaining walls are treated in encaustic paint in rich shades of maroon, yellow and green complementing the logo.